Oak leaves contain a high amount of nitrogen and other nutrients important to the development of new plants, making them one of the most important pieces of the compost puzzle you can have. The problem with oak leaves is their tough, thick membranes take longer to dry out and even longer to break down than other types of leaves. 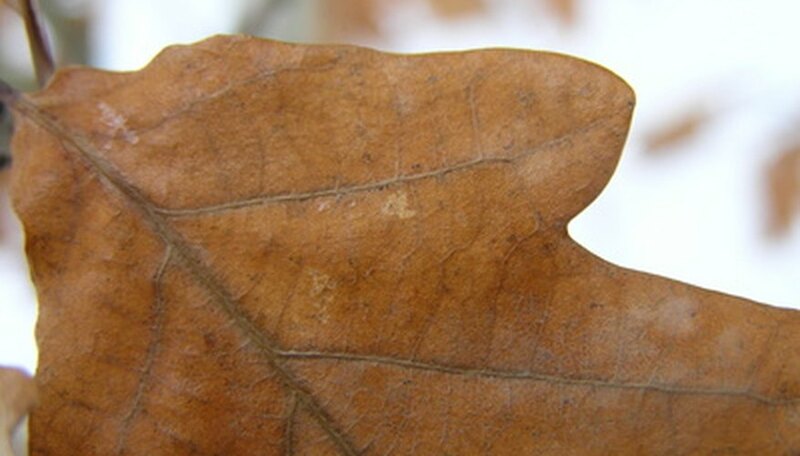 Some gardeners neglect utilizing this resource because of the slow decay time, but the options to speed up the decomposition of oak leaves are simple. Grind dried leaves with a mulcher into fine pieces. Using a hoe to tear up leaves into pieces before raking is another option if a mulcher is not available. Layer chopped oak leaves with green matter such as veggie and fruit scraps, grass clippings, coffee grinds and shredded newsprint. Green matter has a ready level of nitrogen that is needed to start the decomposition process. Chop veggie and fruit scraps for quicker results as well. Turn pile from the outside to the middle with a garden fork every few weeks. Turning helps move oxygen through the pile and keeps the center hot by providing new nutrients for the microbes responsible for decomposition. Keep pile moist like a sponge but not wet. Repeat steps until pile has a spongy, rich black consistency. Oak leaves usually take two years to decompose, but once chopped and helped along with the right compost ingredients, the time can be cut down by a considerable amount. Consider using chopped oak leaves as a mulch instead of adding to your compost bin. Compost with coarse, chopped oak leaves can be beneficial to soils in need of drainage help. Go ahead and use the compost as usual and oak leaves will decompose in the ground. Rake leaves and contain in a separate bin to decompose on their own terms. Never add animal fats, pet feces or non-veggie/fruit table scraps to your composter as they can attract rodents and create a foul smell.